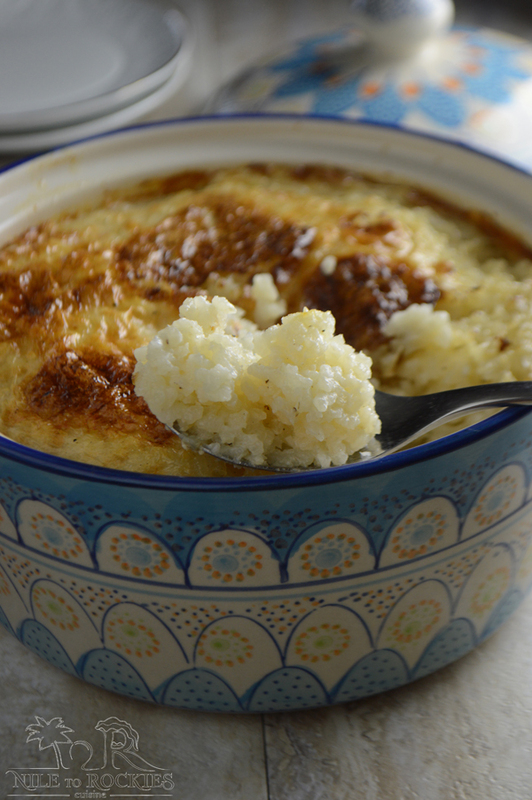 Incredibly creamy rice pudding, very tender and rich. 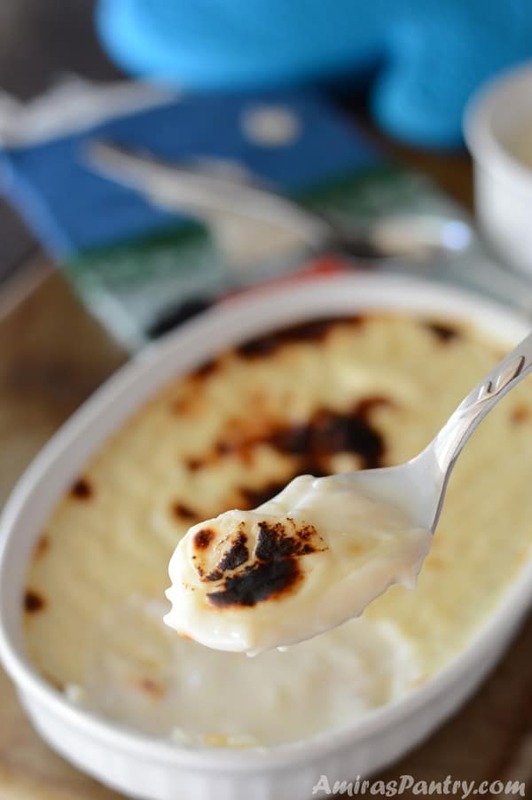 This is a very simple rice pudding recipe that is great for entertaining a large crowd. 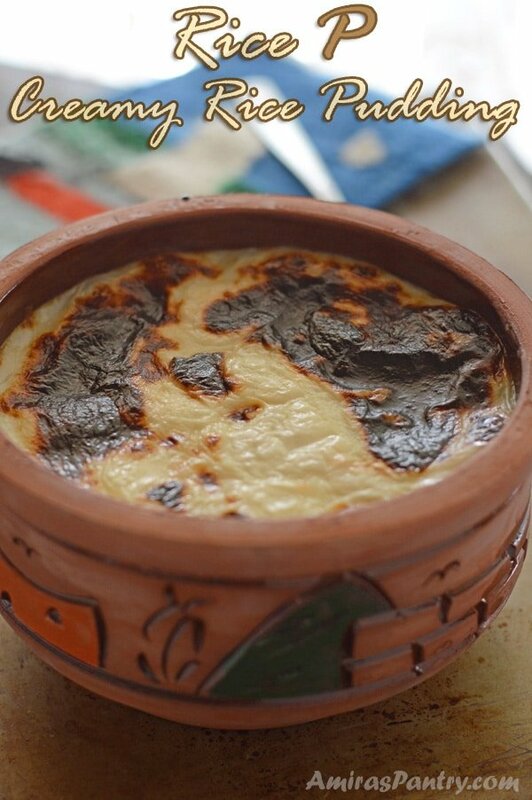 An absolutely delicious treat for my whole family, creamy rice pudding is always on top of my kids list when we visit Egypt. Creameries there are in every neighborhood but there is one specific creamery that makes the most delicious one of them and they get very creative on toppings. When we came here my kids were happy to find that rice pudding is here as well. We stepped into stores to find it in those small plastic containers in the refrigerator section right next to yogurt. When I had my first bite I could not finish it, seriously it tasted like …… anyways :), but my poor kids liked it as it was this or never. I’ve tried making rice pudding in my past life several times but I always ended up with a blob of thick something that was no way near rice pudding :). Sooo I gave up trying and settled for paying $6k to go to Egypt and get my favorite rice pudding from my favorite creamery. Rice pudding is the most international dessert I’ve ever seen until now. But seems that every culture has its own way of creating rice pudding. In Egypt we do not use eggs in our puddings, instead we use cornstarch to thicken any pudding. 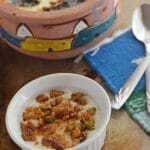 For me a good quality rice pudding is one that has more rice than pudding, not stiff and starchy, creamy and luxurious but unfortunately I could not manage to make a good homemade version of it or even come close. Until……… a couple of years ago, I met this new Egyptian friend – Marwa- here in Denver coming from Kuwait with her beautiful family. Marwa is making the most delicious, creamy and oh so rich rice pudding I’ve ever seen, she even surpassed my favorite creamery in Egypt. She seriously qualifies to open a chain of her own and I bet she will be the most successful. 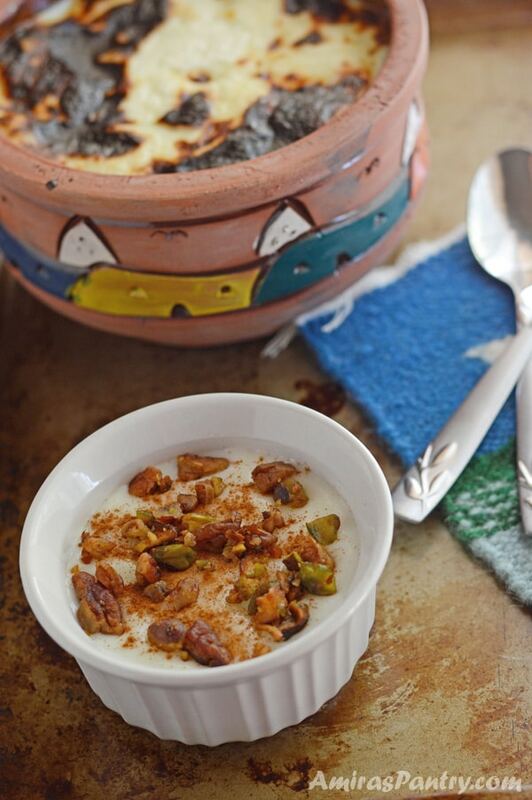 Whenever we meet , all the kids and adults asks for Marwa’s rice pudding. I had to ask what is the secret to this luxurious royal rice pudding? and the answer came as a total shock. It is time consuming, a labor of love to her friends that I cannot handle. I mean I love my family and friends but to cook the rice in milk on the lowest flame possible and keep checking and stirring for a whole 5 hours is waaaaaay out of my reach. You see that’s why I was blessed with Marwa she is really a very dedicated loving person. I had to put on my thinking cap and come up with a way to suite my aging body than standing next to a stove for a whole 5 hours. 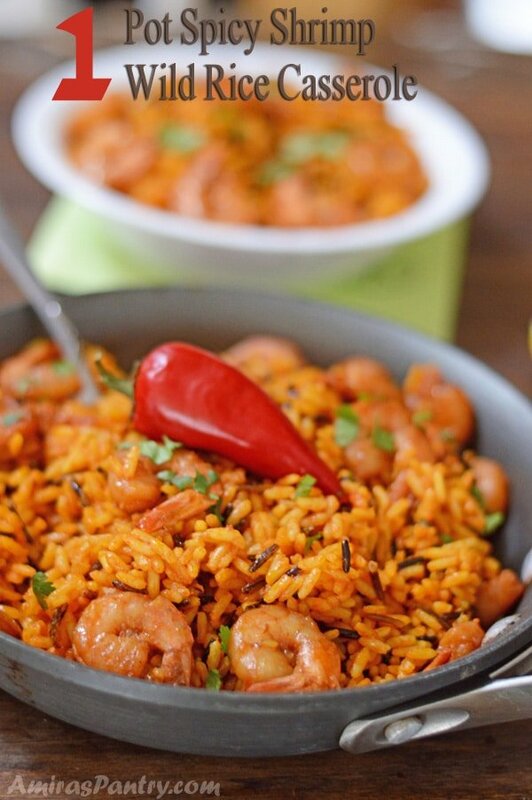 The second problem I had was that part of the rice was scorched in the process of cooking it with milk and you do not want this part to get into your purring so she had to slowly and carefully keep stirring the rice with the back of a ladle…. sooooo annoying. So why not using the microwave, and the microwave it was. I cooked the rice in the microwave in a matter of minutes and I was so happy with the result, and so were the kids and hubby. So let me tell you how I made it. 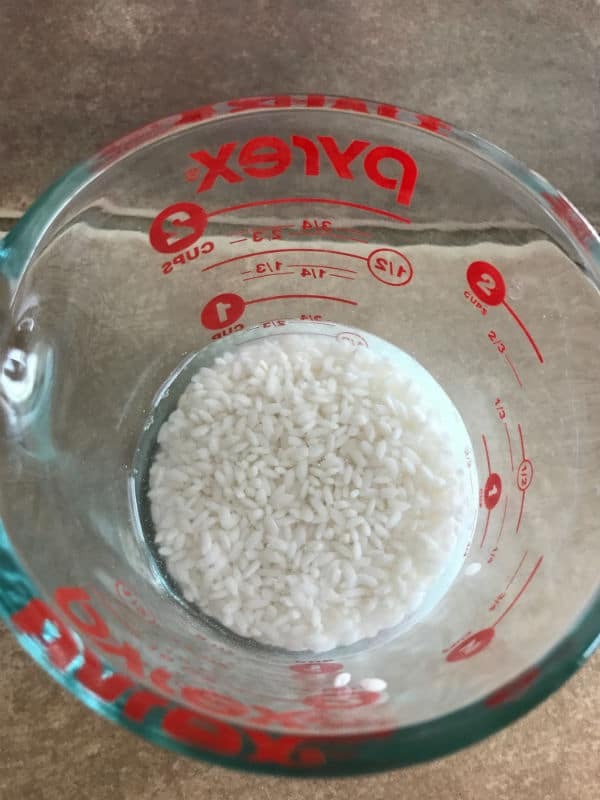 I first soaked my thoroughly washed and rinsed short grain rice in water overnight to speed up the process even more, you can also soak the rice in milk overnight in the fridge for even a creamier texture. Then I added milk by half a cup and microwave for intervals of 1 minutes on high until milk starts to bubble and about to overflow. 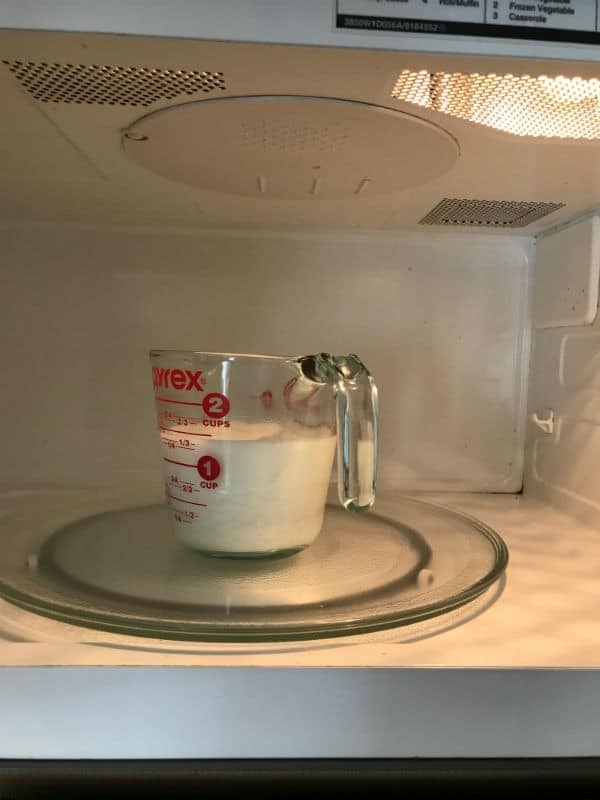 A nice trick I’ve found very helpful is to put in another microwave safe container to catch any dripping milk and putting it back with the rice. Add another half a cup of milk, stir and microwave for 30 seconds intervals. Add more milk if needed until your rice is completely done. Make sure the rice is cooked all the way through not al dente. 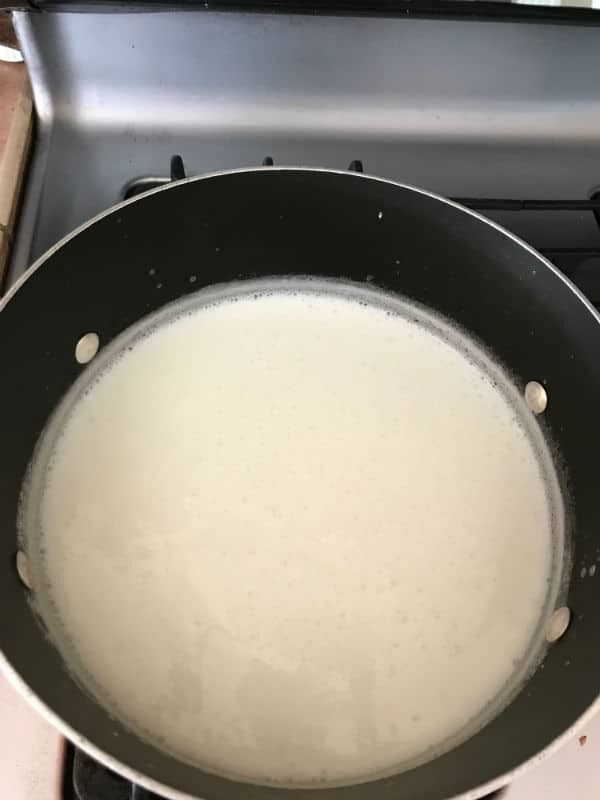 Meanwhile, heat the remaining milk on stovetop on medium until it is just about to form bubbles on the edges, add sugar and dissolve then the cooked rice and stir to combine. Reduce heat to medium-low and add vanilla extract or orange blossom water. Stir in the dissolved cornstarch, stir until it thickens lightly. Turn off the heat then add the table cream. Ladle in individual serving bowls or in a baking dish and broil the top. My kids do not like the broiled top version but for me OMG this is the best part. Digging through the plate, cutting the broiled part and getting deeper to the creaminess deliciousness that lies beneath the surface… Oh boy Oh boy soooo goooood. When it comes to garnishing, the sky’s the limit.. from ground cinnamon, raisins, nuts , fresh fruits, dried fruits , ashta, vanilla ice cream….. whatever you heart is set for. This is a very good dish for entertaining large crowd. Make it, bake it and just let everyone garnish his own dish they way he/she wants. 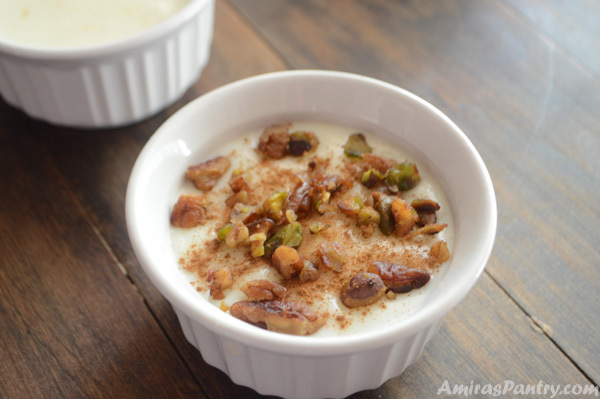 Creamy and rich rice pudding recipe... courtesy to my friend Marwa. 1/2 cup short grain rice rinsed and clean. Ground cinnamon chopped nuts, raisins, ice cream, dried fruits or whipped cream. In a deep bowl or measuring cup, add rinsed rice and water, cover and let it set overnight. 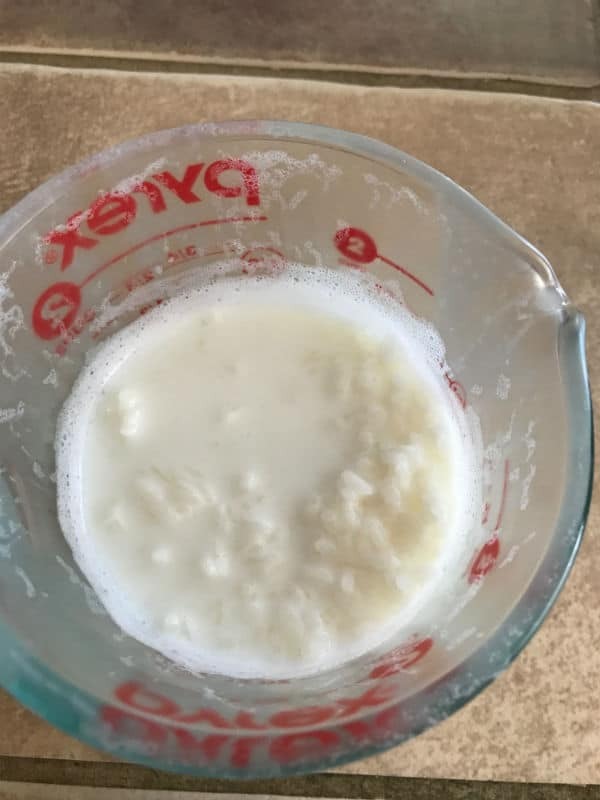 Add 1/2 cup of milk to the rice/water mixture and microwave on high for 1 minute. Stir the rice in the milk then microwave again for another minutes. 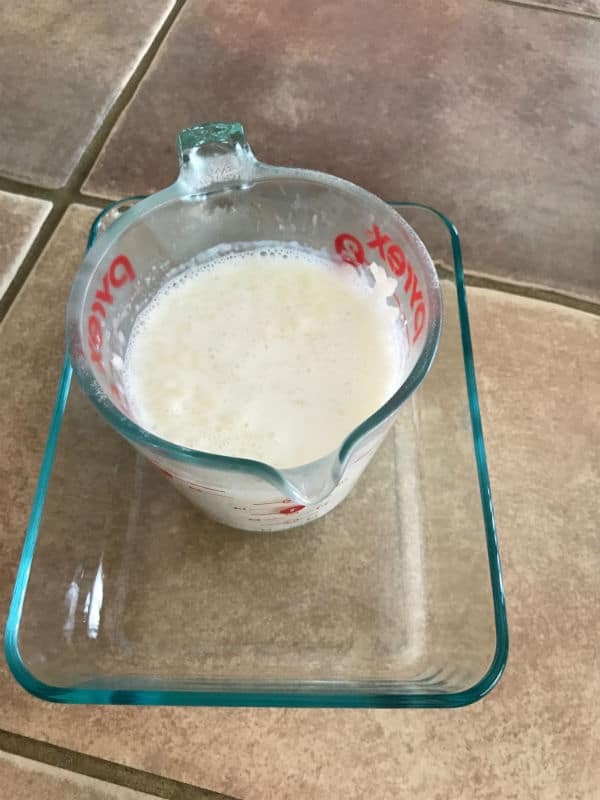 Add another 1/2 cup of milk and keep microwaving for 30 minutes increments until the rice is perfectly done to your taste. Mine took another 2 minutes. In a non-stick pot over medium heat add 6 1/2 cups of milk and sugar, heat until it starts to bubble at the edges. Reduce heat to medium-low add the rice/milk mixture and stir. Add the vanilla and keep stirring for another 2-3 minutes. 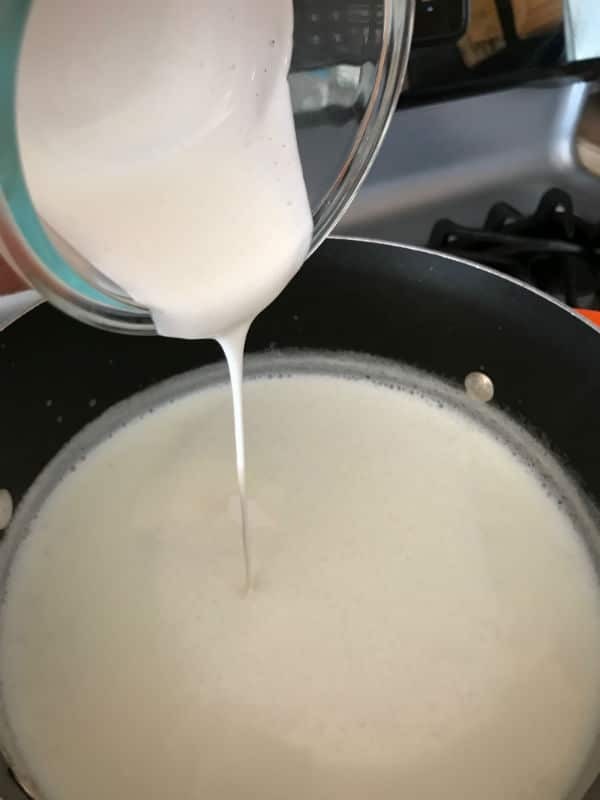 Dissolve the cornstarch in the remaining 1/2 cup of milk then add to the pot. Stir continuously until it slightly thickened. Turn off the heat and add 1/4 cup of table cream then stir to combine. Ladle the rice pudding into individual serving cups/ramekins or into one big deep serving platter a 13x9 pyrex is a great choice as well. You can pop them under the broiler if you want a charred top and this is my favorite way. Serve garnished with dried fruits, nuts or with a scoop of vanilla ice cream. 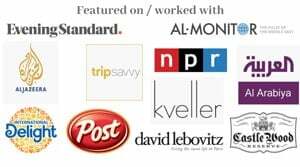 * I used 1 heaping tablespoon for each cup of milk. ** You can also substitute orange blossom water for vanilla. *** Please note that microwave power do vary so keep an eye on your milk. 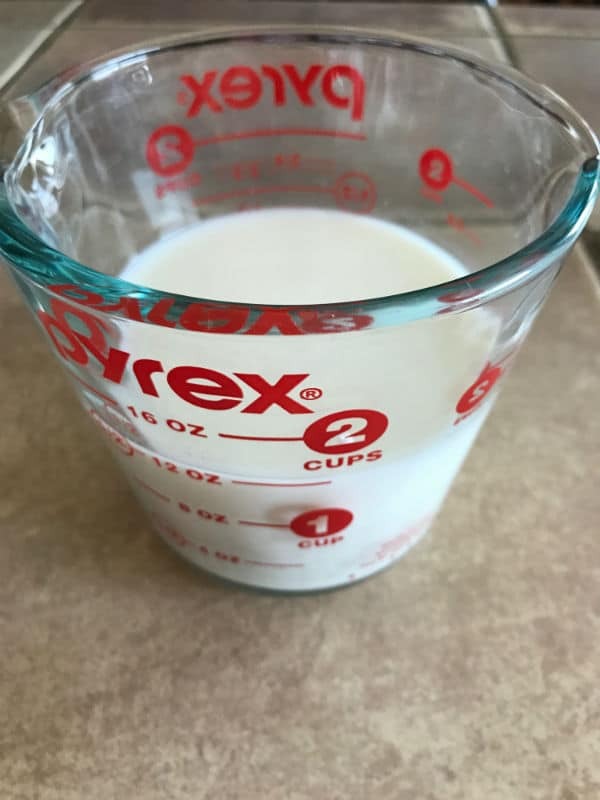 a helpful hint is to place the cup that contains the mixture in another plate of so to catch any overflowed milk so you can easily put it back as well. I love the use of the microwave to fasten the process of softening the rice. Lovely recipe! 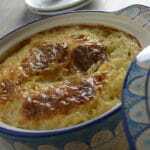 The rice pudding looks oh-so-delicious! 5 hours! I got freaked out for a minute! Hope you are well and your loved ones too.